I can’t lie, I’m in love with this blue armored vehicle by Andrea Lattanzio. Based on the S.H.A.D.O. 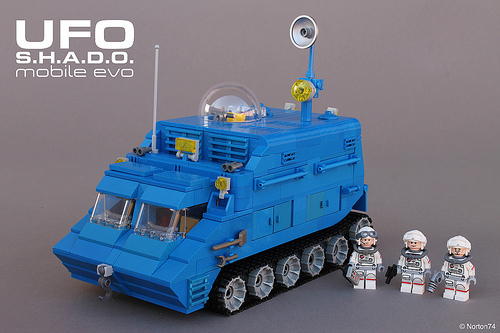 mobile from the 1970 British sci-fi series, UFO, this tracked creation has a ton of great details and features wrapped in a classicly pleasing color scheme. The builder did a great job staying faithful to the original S.H.A.D.O. design while incorporating a few extra touches such as the bubble dome and radar array. Also, the canopy opens to expose a detailed little interior – very cool! With such an assortment of high tech computers and equipment (well, at least for the 70’s) this tracked command center looks more than ready to lead the fight against the alien invaders.